A staycation to Marietta offers a throwback to Christmases past. Even if you don’t hail from a small town, there’s something wonderfully romantic and nostalgic about the holidays in a quaint hamlet. The customs are long-standing; the activities, traditional. And there might even be a dusting of snow to make it all Currier and Ives perfect. Before buying plane tickets to some charming mountain village in Vermont, consider planning a closer escape to Marietta, the Cobb County seat just a drive north on I-75 where you’ll find all the holiday trimmings. To start, nothing shouts Noel like a giant fir tree in the town square, also known as Glover Park. Marietta’s is always gigantic and lavishly lit, and welcomed with considerable fanfare in early December. The event involves local school choirs singing carols and a visit by Santa and Mrs. Claus. For the rest of the month, the tree provides a festive backdrop to the square, already home to a fountain that’s been known to freeze into glassy icicles if the temperatures drop below freezing. In late November, an ice rink attracts skaters of all skill levels for a few hours of winter sport. The park also boasts plenty of benches, a soft-padded playground and a gazebo that’s wildly popular as an outdoor wedding venue when the climate is more seasonable. Restaurants, antique shops, clothing stores and art galleries around the square provide more than a weekend’s diversion. Through the end of December, the north side of the square is jammed on Saturday mornings with local artisans, crafters, bakers and farmers selling their locally grown produce. The market also draws crowds to the Sugar Cakes Patisserie, Jack’s New York Deli, the Australian Bakery and Cool Beans Coffee Roasters for hot drinks, croissants, scones and other breakfast/brunch treats. By dinner, the focus shifts to an international selection: Either on or within a half block of the square, find Mediterranean and Persian fare at Kish, Italian specialties at Piastra, Latin and Asian fusion dishes at Taqueria Tsunami and changing, seasonal, farm-to-table menus at Spring or The Butcher The Baker. Follow up the food with a live show, concert or film playing at the restored, art deco Earl Smith Strand Theatre, built in 1935. At the Theatre in the Square, the annual holiday favorite is The 1940s Radio Hour Show, a mix of classic songs performed between the behind-the-scenes drama of a radio company. Not ready to retire? Check out the late-night live music scene at the Irish-themed pub, Johnnie MacCracken’s, tucked into the town’s former firehouse. With roots dating back to 1788, history is intimately woven into the city’s fabric. Hit the highlights with a Saturday morning ride in the Historic Marietta Trolley as it rolls by the old train depot (now the visitors center), antebellum mansions, the 250-yearold National Cemetery and the Root House, one of the town’s oldest homes. 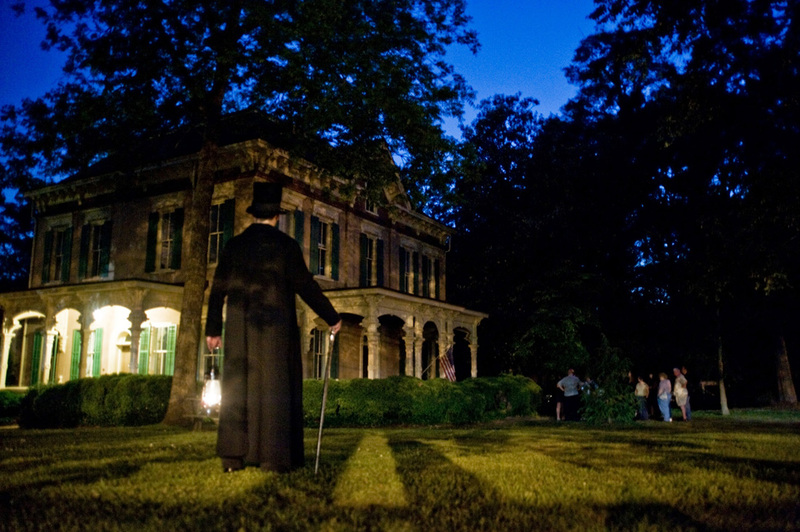 After dark, the same company offers lantern-lit walking ghost tours that recount some of the city’s spookiest history. The visitors center also offers maps of self-guided, themed walking tours, from the town’s black heritage to its historic homes. For those who want to see inside some of those homes, pick up a ticket to the Marietta Pilgrimage, a Christmas Home Tour. This year’s event on December 3 and 4 marks the tour’s 30th anniversary of offering peeks into six private, historic homes that have been lavishly decked out in seasonal finery. After a full day of fun, snuggle into an antique four-poster at the bed-and-breakfast Stanley House Inn, or opt for a contemporary room at the Hilton Atlanta/Marietta Hotel and Conference Center, a short drive from the square. No matter where you sleep, a holiday getaway to Marietta is sure to inspire those sugarplum dreams of days gone by. For details about dining, lodging and activities in Marietta, stop by the Marietta Visitors Bureau at 4 Depot Street; call 770.429.1115; or visit mariettasquare.com.